Grace McCaffery hopes that the bustling streets of New York hold all the promise that the lush hills of Ireland did not. As her efforts to earn enough money to bring her mother to America fail, she wonders if her new Brownie camera could be the answer. But a casual stroll through a beautiful New York City park turns into a hostile run-in with local gangsters, who are convinced her camera holds the first and only photos of their elusive leader. A policeman with a personal commitment to help those less fortunate finds Grace attractive and longs to help her, but Grace believes such men cannot be trusted. Spread thin between her quest to rescue her mother, do well in a new nanny job, and avoid the gang intent on intimidating her. Grace must put her faith in unlikely sources to learn the true meaning of courage and forgiveness. Irish immigrant Grace McCaffery came to New York City for a better life. She takes a job as a nanny to make enough money to bring her mother over from Ireland. When her employers are slow to pay her, she decides to take her new Brownie camera and earn some extra income by selling her photos. A trip to the park puts Grace in danger when she photographs some local gangsters, raising the attention of policeman Owen McNulty. But Grace, who was taken by police to the workhouse when she was a child, has a distrust of men in uniform. Still, she never expects to find one so kind—or attractive. VERDICT Thomson (Brigid of Ireland) has penned a delightful story of overcoming obstacles. Lynn N. Austin fans will savor this historical series debut. Another in-depth and very positive review can be found here. Gotta see more? 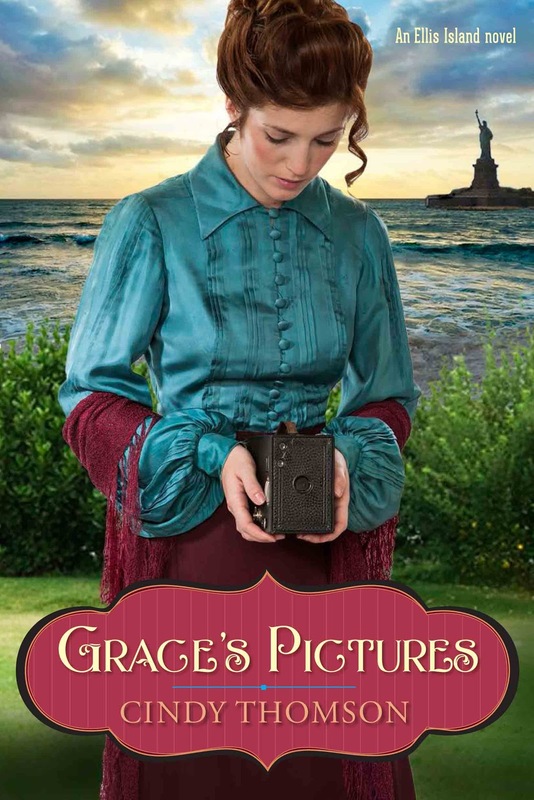 You can purchase Grace’s Pictures on Amazon and read a preview right now! of American Christian Fiction Writers and the Historical Novel Society. Cindy and her husband have three grown sons and live in central Ohio. Get to know Cindy at her blog, on Facebook, on Twitter, or on Pinterest. Click here for a great interview with Cindy on Tyndale’s website. Be sure to visit COTT for next month’s clash!